The AUTHOR BIO from the core book, “Connecting the Dots … with The RESPECT PRINCIPLE” currently in print production. I love my country, but I love the world without the boundaries that divide us more … because I love people and believe we are so much more than what divides us. These are the reasons for my search and finally the discovery of this one thing we can all do to unite us in order to best meet the challenges of the world we have to learn to share. Connecting the Dots … with The RESPECT PRINCIPLE is not the answer to all problems but it is a new, consciously-aware foundation to anchor solutions to all problems upon because the foundation under Connecting the Dots … with The RESPECT PRINCIPLE is the one answer to everything … unconditional love. I urge all of us to think, reflect, discuss, and even argue the practical, the logical, and the compassionate perspectives of Connecting the Dots … with The RESPECT PRINCIPLE so we will discover for ourselves how RESPECT for all, without the need to qualify for BEING VALUED … RESPECTED … is the step in the right direction. I deserve it. You deserve it. We all do. Like it or not, we are all in this life together and how we choose to live is up to us. Our RESPECT LEVEL will always determine what we choose today … tomorrow … the next day. No worries though, as there is a lot of room to grow … and I, as I hope you do, believe we are all worth the effort. http://www.therespectprinciple.com © All rights reserved 2014. Nowhere is this more prevalent than in those who are supposed to lead others into the future … whether the leader is a parent, teacher, principal, counsellor, minister, politician, or mentor of any kind … anyone in a position of authority. How we can determine if we are being led by an “oppressed” leader is by their words and actions that seek to keep us small and limited based on their oppression … their own experience of being oppressed … being told by words and actions their dreams and goals were not possible and so took the path their own leaders told them to take … and they too became like their leaders … oppressed, bitter and jaded … passing on the legacy of oppression without even knowing it. Over my lifespan, what was applauded in my life was my conformity to other people’s expectations, regardless of what I wanted. Just because I could do well what other oppressed people valued, did not mean I valued what I could do … and over time, the denial of what I knew I could do, with time, study and experimentation turned me into an oppressed, bitter and jaded person till I became so sick in the spirit I had no desire to live. Interestingly enough, as my Respect Level has grown, I repeatedly have to stand up against, not the physical oppression, but the constant onslaught of the oppression of the unconscious … a “traditional” mentor who attempted to slay with sarcasm and dismissal that writing a book was not “real work,” which I gather he has never done because he would know how much work it is … an employment “counsellor” who also attempted to dismiss “creativity” as something wives of Bruce Power husbands do because they can afford to create at their leisure and at their husband’s expense. As I wrote yesterday in, “If I knew then what I know now …” my few previous attempts to reclaim my own identity, gifts, talents and abilities have been met with an unexpected backlash of negativity and what I now recognize as the spirit oppression by those who too were spirit oppressed but still do not know it. All of which fuels my passion even more to raise both individual and our global Respect Level because we know what to do with the oppressors who use violence physically … we return the same on them, but as of yet, on a mass level, we have not even recognized how we are passing on the oppression by the denial of its existence and its impact on our lives and the lives of those we lead by example. To “oppress” means to weigh heavily on the mind, spirit or senses; to keep down by the cruel or unjust use of power; tyrannize over. Being “oppressive” is distressing, not only physically but also mentally. When any person takes on any role of leadership, guiding and mentoring others, what would serve everyone is simply the recognition of one’s own oppression, overcoming it and helping others to do the same … so they can rise to their potential … not be limited by oppression’s weight that attempts to keep people small, limited and powerless … because keeping people small, limited and powerless is also what drives our economy … keeping our wealth capped by the those who seek their false security by their control by oppression over other people … so they feel more valued … respected. The problem is oppressors will never ever find the peace and wealth they crave … because peace and wealth are only born of the freedom to be who we really are as unique individuals discovering, developing and delivering to the world what only we have to offer. Ironically, in the end, the oppressors are the ones who ultimately suffer the most by the legacy of oppression they pass on … for they will never be happy, satisfied, fulfilled … and wealthy in the way that counts most … in their spirit. 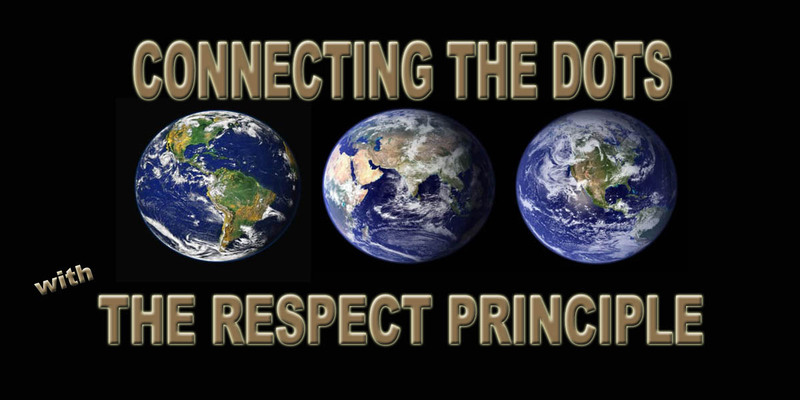 All rights reserved by KAT (Kaitlin Ann Trepanier) and DARK HORSES PRODUCTIONS launching September 2014 … Entrepreneur, Creative Writer, Visual Artist, The RESPECT Specialist and Architect of the global initiative Connecting the Dots … with The RESPECT PRINCIPLE … because every child … every person … should know, by their own experience, they are valued … RESPECTED.